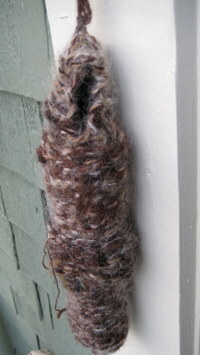 HOMEFREE: Knitting : Bushtit nest. Bushtits were not part of my bird life in Ontario; I made their acquaintance when I moved to the west coast. Tiny and egg-shaped, when they cover a piece of hanging suet they resemble a bunch of grapes - moving grapes! The first bushtit nest I saw I thought was an old sock hanging in a tree. Learning that the nest is woven from moss and lichen and plant material - and spider webs! - and the passageway from the hole at the top to the 'nursery' at the bottom is lined with fur and feathers and fluff I was astonished and fascinated. I wanted to honour such an incredible structure so I knit this humbly-human one. It is a mixture of fibres with white mohair used to represent the spider webs. When I took it out on the deck to photograph it for this posting, and the bushtits were on the suet feeder, I hoped they were honoured but I suspect they were giggling.